The following story was translated from the Russian by Helena P. Blavatsky and first published by her in “Lucifer” magazine, London, November, 1889 edition, pp. 195-98. Its general title was “Russian Popular Tracts – Selections from Count L. N. Tolstoy’s Tales”. The story itself was entitled “How a Devil’s Imp Redeemed his Loaf; or the First Distiller”. “Lucifer” (literally, “light-bringer”) is the ancient name for the sacred planet Venus, the “elder sister” of our planet Earth and the “star of the morning”. The meaning of the word has been distorted by medieval theologians so as to be a synonym to another theological fiction made popular by them, “the devil”. Tolstoy’s story uses this same popular idea of personalized devils to symbolize those lower energies in human psyche which create tests and obstacles to human evolution. “The wild beast’s blood is ever present in man, but it remains latent and finds no issue so long as he has no more bread then he needs for his food”. 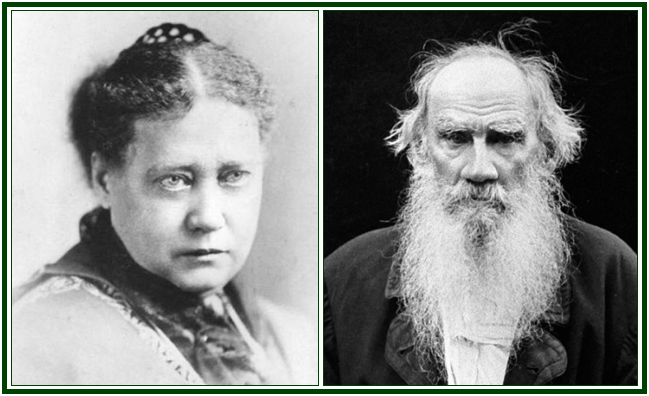 Since the West has shown such due appreciation of the writings of the greatest novelist and mystic of Russia of today, his best works have all been translated. The Russian, however, recognizes in none of these translations that popular national spirit which pervades the original tales and stories. Pregnant as these are with popular mysticism and the spirit of theosophical altruism, some of them are charming but most difficult to render into a foreign language. Yet, one may try. One thing is certain: no foreign translator, however able, unless born and bred in Russia and acquainted with Russian peasant life, will be able to do them justice, or even to convey to the reader their full meaning, owing to their absolutely national idiomatic language. If the genius of the Russian literary language is so sui generis as to be most difficult to render in translation, the Russian of the lower classes – the speech of small tradesmen, peasants and labourers, is ten times more so. Difficult as it may seem to a foreigner, yet a born Russian may attempt it, perhaps, with a little more success. At all events, as said, one may try. Selecting therefore, from such popular tracts, – allegories and moral stories in the form of popular tales – we have translated some for the readers of “Lucifer”. The Christmas Numbers, December, January and February, will contain charming little stories, well worthy of a new translation. Two of them, “Wherein is Love, Therein is God” ; “God is in Right, and not in Might”, and some others are stamped with the spirit of truly religious mysticism. Each deserves to be read by the admirers of this great Russian author. For this number, however, we have selected one of a less mystical but more satirical spirit; a cap calculated to fit the head of any drinking Christian nation ad libitum, and we only hope its title, translated verbatim et literatim, will not shock still more the susceptibilities of the opponents of the title of this magazine. Russia is afflicted with the demon of drink, as much as, though not more than, England or any other country; yet it is not so much the Karma of the nation, as that of their respective governments, whose Karmic burden is growing heavier and more terrible with every year. This curse and universal incubus, drink, is the direct and legitimate progeny of the Rulers; it is begotten by their greed for money, and FORCED by them on the unfortunate masses. Why, in Karma’s name, should the latter be made to suffer here, and hereafter? The Imp got terribly frightened at this threat, and running up to earth again, he set himself to thinking how to atone for his guilt. Thus he thought, thought still, and thought more, and went on thinking until he had found what he had to do. Assuming the appearance of a good fellow, he offered himself as a labourer to the poor peasant; and as it happened to be a drought, he advised him to sow his seed in a swamp. Hence, while the fields of all the other peasants were parched, and their harvests burnt by the sun, the crop of the poor peasant grew high and thick, full and grainy. His household had bread to their heart’s content up to the next harvest, and the surplus proved considerable. The following year, the summer being wet, the imp taught the peasant to sow his seed on the mountains. While his neighbours’ corn was blasted, fell down and got rotten, the peasant’s field on the hills brought forth the richest harvest. The moojik stored still more of the corn; and did not know what to do with it. Then his labouring man taught him to press the corn and distill it into spirit. Having distilled plenty of it, the moojik took to drinking and making others drink thereof. One day the Imp returned to the Elder boasting that he had redeemed his loaf. The Chief went up to see for himself. Then came the Elder to the moojik, and found that having invited the richest and wealthiest of his neighbours, he was entertaining them with whiskey. There was the mistress carrying the glasses to her guests. Hardly had she begun her round when stumbling over the table, she upset the drink. Out at her flew the moojik abusing his wife to his fill. This pleased the chief Devil immensely; as to the Imp, he boasted more than ever: “You wait and see what will come next!” he whispered. The peasants had each one glass more, and forthwith their talk became louder and more brutal. Instead of honeyed speeches, they proceeded to abuse each other, and turning gradually fiercer, they ended by getting into a free fight and damaging each other’s noses badly. Then the host took also a turn and got soundly thrashed. The peasants had their third round, and quite lost their reason. Grumbling and hiccupping, shouting at each other, and knowing not what they said, they rushed out, some alone, some in couples, and some in triplets, and scattered in the streets. The host trying to see his guests off, fell with his nose in a mud-puddle, rolled in it and unable to rise, lay there grunting like a hog . . . . This pleased the Elder Devil most of all. For which invention the Elder Devil freely praised his Devil’s Imp, forgave him his failure with the stolen loaf, and promoted him in Hell. The short story “Wherein is Love, Therein is God”, by Leo Tolstoy, is available at our associated websites.